We had a chat with the duo's Vish Mhatre following the smashing success of their label's first EP. In recent years, there has been a global surge of interest in unearthing forgotten Middle Eastern music of times gone past. While this phenomenon is almost entirely popularized by individuals and entities based out of western countries, a very small percentage of it can be accredited to regional efforts. Dar Disku, which literally translates into ‘home of the disco’, was a popular, independent 1970s Egyptian pop culture magazine that currently has little-to-no traces of existence. 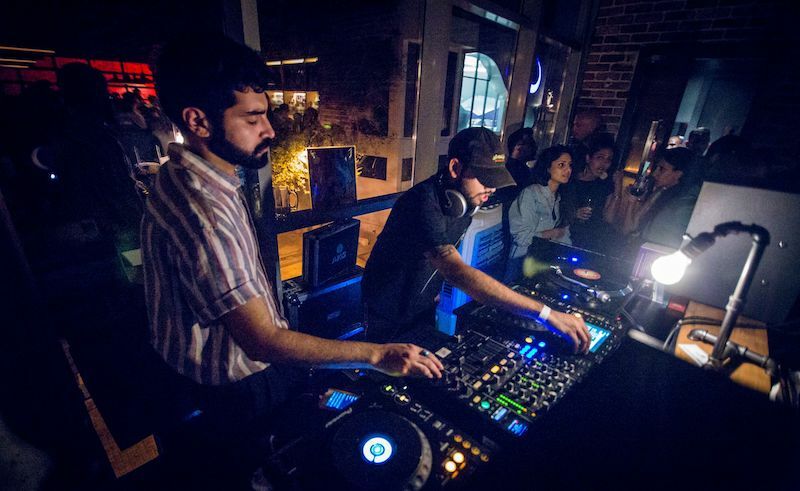 The name Dar Disku has been picked recently by Bahraini DJ/producer duo, Mazen AlMaskati and Vish Mhatre, as the name for both their act and their new record label, which they launched in 2018. Growing up less than a mile apart in Bahrain, Mazen and Vish shared a passion for discovering new music and quickly bonded over digging for hidden gems. In accordance with that statement, Dar Disku released the first EP on their label this past January featuring two tracks; their own edit of a Syrian wedding song and Irish producer Jamal Sul AKA Moving Still’s edit of an Indonesian ‘60s classic. We caught up with the duo’s Vish Mhatre to reveal more of what Dar Disku are all about. So when, where and how did you guys meet? And how did you relationship evolve? We met during school through mutual friends. They used to throw some pretty special parties which we attended and we instantly bonded over our love for the same music. We are both drummers and that really played a big part of our initial relationship, as we would often swap records and iPods for us to listen to over the weekend. Mazen’s crate was mainly filled with rock and independent music from the states and the UK and he introduced me to the left field world of Radiohead, Sigur Ros and Bjork. At the same time I was sharing my love for hip hop and introduced Maz to the early 2000’s Scott Storch produced pop hits as well as Timbaland, the Neptunes and J Dilla. Where are you both based at the moment? We’re based between Bristol, Scotland, London and Bahrain. We have been traveling a lot recently with shows in Lisbon, London, Istanbul, Dublin and Mumbai all within the last six months. And when did Dar Disku both as a duo and label kick off? I would say the end of 2018, we really started touring and digging together. Although, as a concept, its existed for over a year. How did you get in touch with Jamal Sul aka Moving Still and sign one of his tracks? A promoter sent out an advance before our debut show in Dublin with Jamal looped in. We did some digging to see who was on the line-up for the show later that month and saw he had shared an edit on his Soundcloud the same day. The moment I heard it, I remember calling Mazen straight away and saying “I think we found it." We then exchanged a few emails and phone calls and made it very clear we wanted him. We had a few drinks in Dublin and signed the deal over some Peking duck and champagne at the Hang Dai. So what are the original records sampled on Dar Disku’s first release? 'Bas Asma3 Mini' by Sarya Al Sawas who’s a popular wedding singer from Syria, and 'Ya Mahmud' by Orkes Kelana Ria, which was released in 1962 in Indonesia. The song features vocals by the mysterious 'Munif'. Were you surprised by how well received the first release was? Yeah! Even till today, seeing the reaction it gets when we drop it live, as well as people messaging in when we play it on radio is the best feeling. We’re really lucky to have some big entities on board such as Resident Advisor, Clash and Vice. It’s been played a lot by our good friend Nabihah Iqbal on her BBC and NTS radio shows too. I played it in Lisbon recently to close the night and it got wild! Do you sometimes feel that your music is more well received abroad than it is in the Middle East? I don’t think so. At the end of the day it’s dance music and I think that’s a universal language. With that being said, I think our western audiences don’t understand much Arabic, so they tend to focus on melodies and rhythms. This usually results in some amazing reactions when we play rhythm and synth heavy hits like 'Wenu Wenu' by Omar Souleyman. There’s currently a growing movement of re-releasing/remixing both obscure and commercially successful Arabic hits from previous decades led by labels like Habibi Funk, Ostinato and Radio Martiko. Where do you see Dar Disku fitting within this movement? I think Dar Disku is different as it’s a platform and collective for all things art and music from the Middle East and beyond - and is not just a label. It acts as somewhat of a bridge of the Middle Eastern communities around the world; whether that’s first generation immigrants to the west or other who have taken on new nationalities by birth and helping them discover their Middle Eastern roots. We issue all things old and new and are not exclusive to Middle Eastern artists. We pay much more focus to the story of the artist and their links with the Middle East, rather than the content of the actual track. Are there any new releases lined up? Yes - we are releasing a single by Algerian/UK duo, Lynda, an r&b track paying homage to escapism. This isn’t an 'Arabic edit', but something that showcases that Dar Disku isn’t limited to releasing exclusively Arabic music. What does the scene in Bahrain look like right now? Do you feel like you’re the only pushing for your sound there? I think the true Bahrain scene is extremely underground. There is a focus on playing music to the masses, playing what people want and often booking international artists. There are bands often playing covers of popular tracks or DJs playing top 40 hip-hop or pop with a saxophonist in the background playing on top. In reality, there’s nothing wrong with that, but we feel that there is so much talent to be discovered and channelled properly. We want to create a scene and sound that is truly original, where artists write their own music and don’t play covers. Where DJs dig crates and not charts. With that being said, many venues help support this, in particular Calexico who always put local talent first. How would you compare the Arab musical heritage compared to the regional music nowadays? The older Arabic tracks have one thing that the newer tracks often lack, which is nuance. Artists like Googoosh and Fairuz had intricate melodies that aren’t really present in regional music nowadays. Again, there seems to be a focus towards pop and dance music, but at the same time, the resurgence of the underground has been amazing. The niche scenes in Palestine, Saudi and Algeria are very inspiring and original. Any upcoming plans you’d like to share with us? We’ll be touring a lot and will have a new EP in mid-to-late 2019. We’re playing some very exciting shows soon. We’re headed to Paris at the end of April for a session at Le Mellotron and then to Test Pressing Festival in London alongside Baris K and Khidja. After that we return to Dublin for (hopefully) another sold out night at Woweembeem. After that we have some dates at Percolate, Jam City and Lovebox Festival in the UK. Follow Dar Disku on Facebook, Soundcloud and Instagram.